This report should be about Friday 24th July – but that was cancelled due to heavy rain, so this is about Thursday 30th July. The day bode well – with bright sunshine and blue sky with scattered small white clouds. We met as previously, at the car park just off the main road where the road runs down to Clearbrook. Initial progress was fast, although later the growth became more dense. 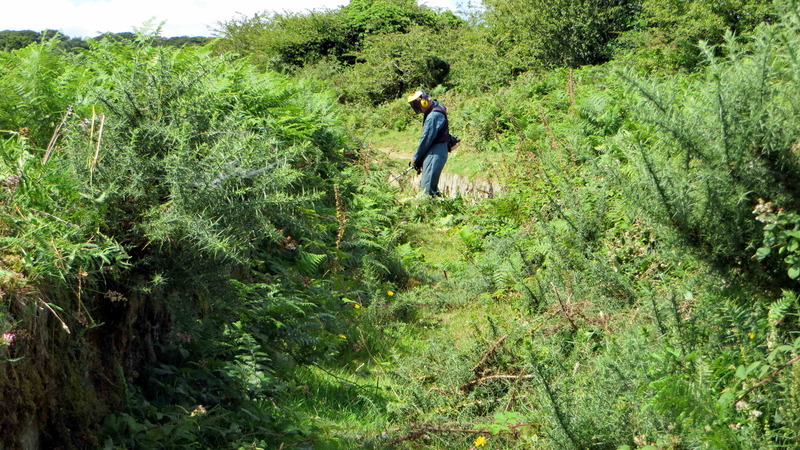 Some more gorse falls, ready for raking. As the morning progressed it became quite warm and the coffee break was welcome! 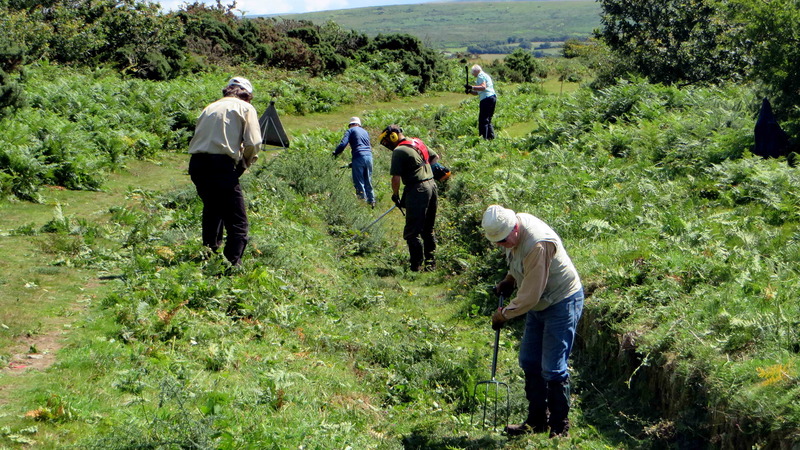 The volunteers today were Chris Francis, David Auty, Derek Collins, Elaine Viant, John Viant, John Watson, Keith Ryan, Rachel Watson, Sylvia Hamilton and Val Barns; 10 in total. We have to thank Rachel once more for bringing cake – apple and walnut (very succulent) and fruit cake (just as good)! Working near the DPA At Work sign. 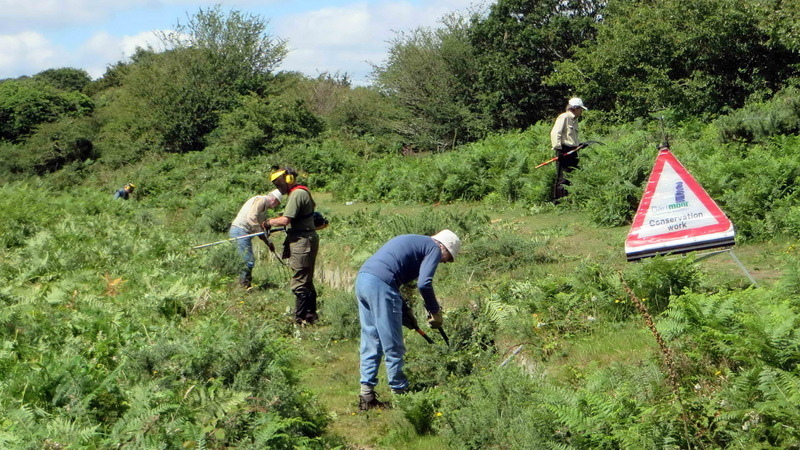 The cuttings are “lost” a few metres away from the leat i.e. 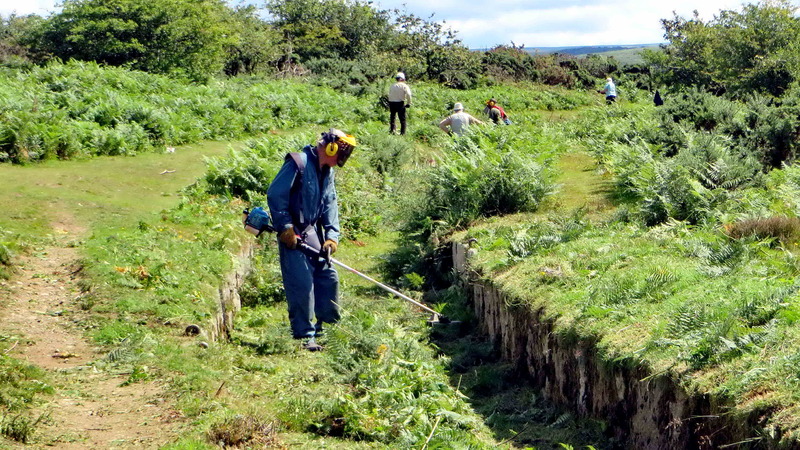 hidden in the undergrowth using the forks – there were six in use today and they were kept busy clearing up after the three brush cutters. Area of more dense vegetation. 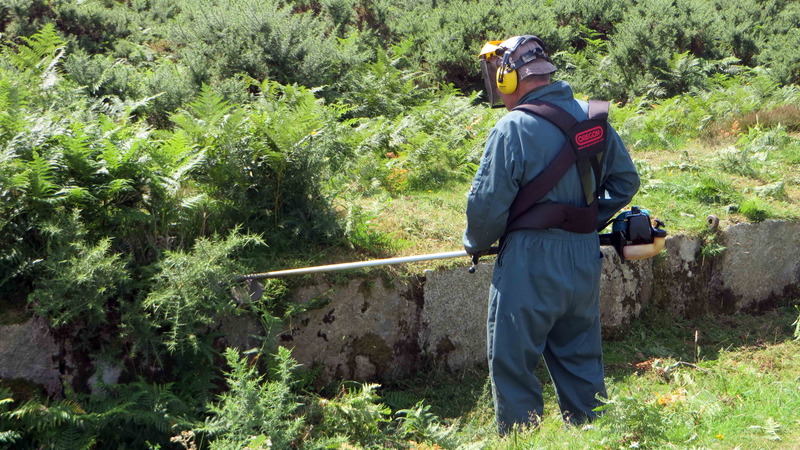 Today was marked by the discovery of two sets of iron rings at SX 51084 64521 that were set into the leat side wall, close to a concrete base that we thought were probably something to do with the WW2 decoy airfield that was built here to lure enemy planes away from nearby RAF Harrowbeer. There is a map of the decoy airfield here. Pair of iron rings set into the joints between granite slabs. The rings may have held cable supports for lighting towers that were erected in the vicinity. 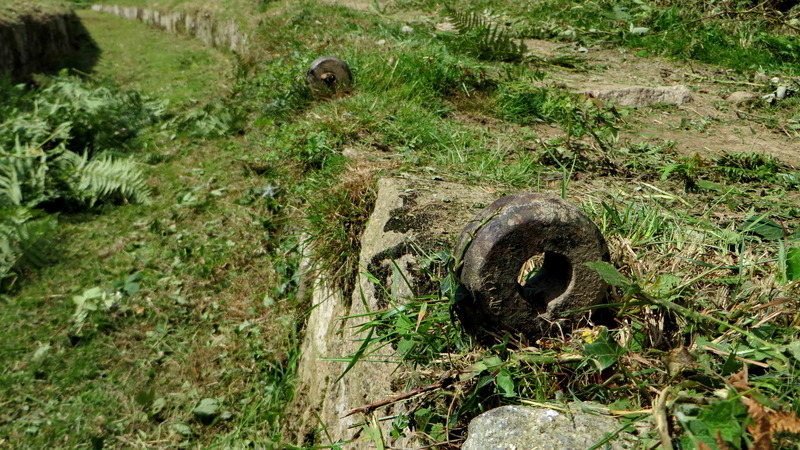 A closer view is shown in the final photograph …..
An “end on view” of a pair of iron rings. 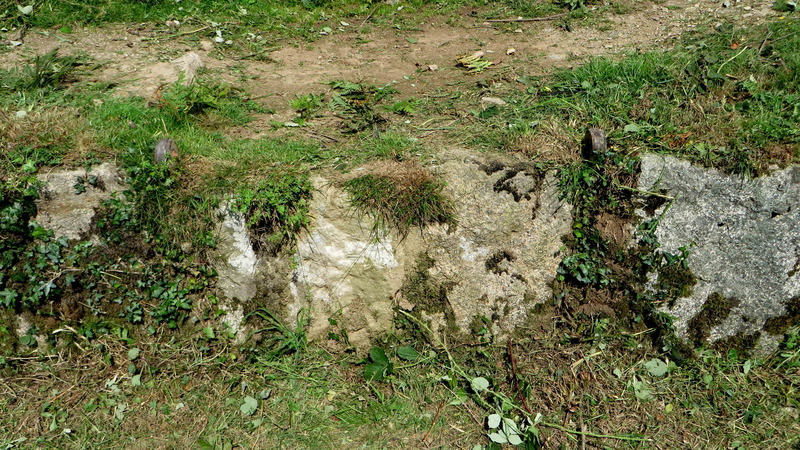 The two pairs of rings were offset from each other by about five or six metres on opposite sides of the leat. A GPS track of the day’s work, 240 metres (262 yards) – reflecting how hard the work was compared to 500 and 551 metres previously – has been added to the project Google Satellite map HERE.